Brock forward Dani Elgadi drives to the hoop through a host of James Madison Dukes. In the second consecutive game between the Dukes of James Madison and the Brock Badgers, it was the Badgers who prevailed Monday night, notching a 78-75 victory at the UVI Sports and Fitness Center. Brock guard Dani Elgadi led all scorers, finishing with 23 points and a team high 9 rebounds. Elgadi had a strong supporting cast, as forward Cassidy Ryan put up 17 points and 7 rebounds. Guard Johneil Simpson added 16 points and Michael Asemota chipped in 13 points in the victory. Although the game remained close throughout, the Dukes could not find their rhythm in the second half and failed to get defensive stops when they needed them. JMU was lead by freshman Zach Jacobs, who tallied a team high 13 points and 10 rebounds in the loss. Brock lost to JMU, 78-75, in Sunday’s game. 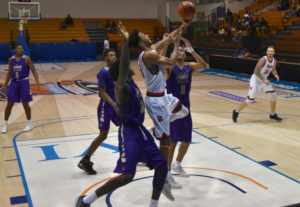 The game was part of the Paradise Jam Summer Tour, which concludes Wednesday night at the UVI Sports and Fitness Center, as the USVI Men’s National Team takes on JMU in the final game of the tour. Tipoff is scheduled for 6 p.m.